BAODING, China (Reuters) - When pigs on the Xinda Husbandry Co. Ltd breeding farm in northern China began dying in growing numbers in early January, it looked increasingly likely that the farm had been struck by the much feared African swine fever, an incurable disease that has spread rapidly across the country since last year. 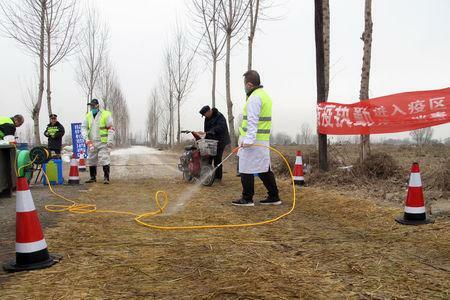 But after taking samples from some pigs, local officials in the Xushui district of Baoding city, about an hour's drive from Beijing, said their tests came back negative, said Sun Dawu, chairman of Hebei Dawu Agriculture Group, the farm owner. Sun's account of events and pictures taken by farm staff of dead pigs lying in rows and a pile outside the farm could not be independently verified. Xushui district said in a faxed response to Reuters on Tuesday that it was opening an investigation into the case, adding that it had found some "discrepancies" with the reported version of events. "If there is illegal behavior, relevant departments will handle it according to the law," added the statement from the local government's investigative committee. Farmers and other industry insiders told Reuters that China's African swine fever epidemic is far more extensive than official reports suggest, making the disease harder to contain, potentially causing pork shortages and increasing the likelihood that it will spread beyond China's borders. "Our full expectation is that the number of cases is under-reported," said Paul Sundberg, executive director at the Swine Health Information Center in Ames, Iowa, which is funded by American pork producers. "And if there's so much of that virus in the environment in China, then we are at increased risk of importing it." "Public confirmation of disease is the government's job," Sun told Reuters at his company headquarters in Xushui in late February. Frustrated by the lack of action and mounting losses from the disease, Sun eventually published details of the suspected outbreak on China's Twitter-like platform Weibo on Feb. 22. Two days later, it became the first African swine fever case in Hebei province, one of the north's top pig producing regions, to be reported by China's Ministry of Agriculture and Rural Affairs, about seven weeks after the company says it had alerted local authorities. China's Ministry of Agriculture and Rural Affairs did not reply to a faxed request for comment on the case. Detailed accounts of unconfirmed outbreaks shared with Reuters by two other farm company managers suggest Sun's experience is not unique. When the disease hit one of the company's 6,000-head sow farms in the northeast in November, local authorities did nothing, the official said. "It was never tested by the government. We couldn't do the test because we didn't have the capability. But there's no question it was ASF, based on the symptoms and lesions," he told Reuters, declining to be identified because of company policy. But wealthy Shandong province, northern China's biggest producer of hogs, has only confirmed one case of the disease, on Feb. 20. After the company's first outbreak in early January the local government tested and the results came back negative, said an executive, who declined to be identified because of the sensitivity of the issue. Shandong province's animal husbandry bureau did not respond to a fax seeking comment on unreported cases. Analysts forecast pig production in China, which eats about half of the world's pork, will fall more than during the 2006 'blue ear' epidemic, one of the worst disease outbreaks in recent years, with some expecting a decline of around 30 percent in 2019. "You need to move faster than the virus, it's a very simple equation of how to control disease," said Trevor Drew, director of the Australian Animal Health Laboratory at the national research agency, the Commonwealth Scientific and Industrial Research Organization. "If you don't know where the virus is, you can't stop it." Since August 2018, Beijing has reported 112 outbreaks in 28 provinces and regions. The increase has slowed considerably in 2019 and the agriculture ministry said earlier this month the situation was "gradually improving". "I am very much hoping that I am wrong, but if I consider the epidemiological characteristics of this virus disease, I would have to be extremely skeptical," said Dirk Pfeiffer, a professor of veterinary epidemiology at the City University of Hong Kong. He pointed to the "spatial randomness" of the reported outbreaks, unusual for an infectious disease, which normally develops in clusters. "The large producers have not been spared," said a manager with a company that supplies several of China's top pig producers. "Everyone is trying really hard on biosecurity, but they're still getting outbreaks, and they're frustrated and losing hope." Qin Yinglin, chairman of China's No.2 producer, Muyuan Foods Co Ltd, which raised 11 million pigs for slaughter last year, said most large companies were likely to be infected. "If you checked carefully, testing one-by-one, then for sure everyone has it," he told Reuters in an interview. "This is a high probability event." He said it was "not yet known" if his firm had been hit.